India's Defense Ministry announced in February its intention to cancel its order for 126 Rafale jet fighters produced by French aircraft manufacturer Dassault because the price was higher than announced in 2012. According to local media, India is considering Russia's Sukhoi SU-30MKI (a special version released for import into India) among the possible alternatives to the French fighter. 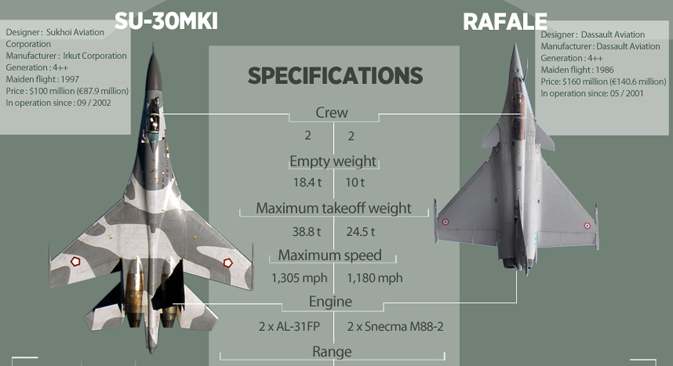 RBTH offers a comparison of the main technical specifications of the two aircraft. India's Defense Ministryannounced in February its intention to cancel its order for126Rafale jet fighters produced by French aircraft manufacturerDassault because the pricewas higherthanannouncedin 2012.According to localmedia, Indiais considering Russia'sSukhoi SU-30MKI (a special versionreleasedfor import intoIndia) amongthe possible alternatives to the French fighter. RBTHoffersa comparison ofthe main technical specifications of the twoaircraft.